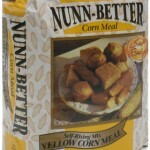 Nunn-Better has been offering the highest quality flour and corn meal since 1926. Nunn-Better flour and corn meal are ideal for scratch bakers looking for great homemade taste and in many families it has been a tradition from one generation to the next. Try some today!